Sickle Cell disease affects mainly Africa-Americans in this country, with about 70,000-80,000 cases existing. Sickle cell afflicts roughly 1 out of every 500 live births in this community. 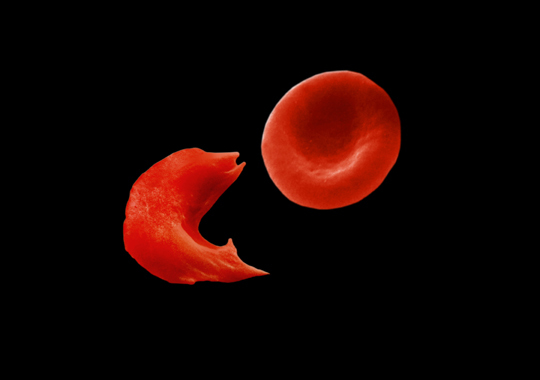 Because of a structural/biochemical anomaly, when affected red blood cells (rbc’s) lose oxygen, the red blood cells sickle in shape and become sticky, clumping in small blood vessels. A host of complications arise, leading to premature death. More here. Adult blood stem cells, present in bone marrow, are transplanted into the bones of children whose own marrow has been destroyed using chemotherapy. The child then produces a whole new healthy source of rbc’s, as well as a whole new immune system with no chance at tissue rejection. This can’t be done in adults, who have already suffered too much organ damage. Adults receive adult stem cells that are matched to their human leukocyte antigens (HLA), the unique identifying proteins on cell surfaces used by the body to determine what is that person’s cell and what is a potential pathogen. The closest HLA matches are family members. Interestingly in these adults treated, there was no sign of tissue rejection, and the disease was effectively reversed in 9 of 10 subjects. That’s awesome news! No need for embryo-destructive research. Now for some inconvenient truth. There are ways to increase the available pool of donors in the African-American community. 1. Bank cord blood at birth using medicaid money for mothers who have limited means. It’s cost-effective in the long term. 2. Stop the abortions. African-Americans make up 12% of the population and have 37% of the abortions. This represents an enormous pool of potential donors being selected against every year. 3. With illegitimacy approaching 70% and too many families being comprised of siblings with different fathers, it’s harder to find HLA matches within families. A return to stable family paradigms makes good medical sense as well as good moral sense. Good morality is good medicine. Adult stem cells continue to steamroll their embryonic counterparts.